Who are the eponymous lawbreakers? Is it the 18 criminals and law enforcers spanning the roster of Boss Key’s debut, doomed to an eternity of 5v5 brawls in cyberspace? Is it you, the player, defying multiplayer shooter convention by using your footwear to frag people? Or is it, in fact, Boss Key Productions, helmed by Cliff Bleszinski and evidently determined to give modern competitive shooter design the finger? Boss Key is dead! Check out guide to the best FPS games that live on. For legal reasons I’m obliged to make clear that neither you nor Boss Key are in violation of any law that I’m aware of. But look, what matters is that all three of those aforementioned elements are what make this a successful endeavour. 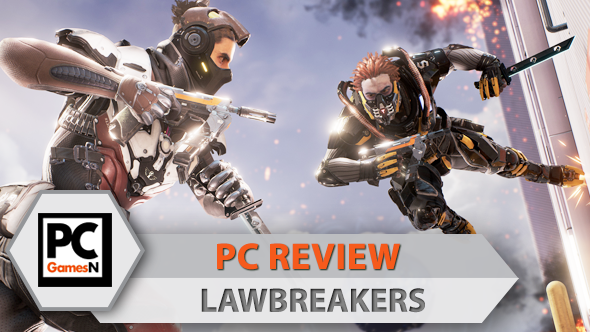 LawBreakers is expertly crafted, thoroughly enjoyable, and even reasonably distinct in such a saturated market. It achieves that by ignoring the rules. The most obvious example is found in its class-based combat. At first it seems like a weakness that each of the nine classes has a role that amounts to ‘go and shoot the people’, and that, unlike staunch class-based affairs Team Fortress 2 and Overwatch, none of its characters’ primary weapons are anything other than a damage-dealer. In time, however, the feeling sets in that LawBreakers is justclass-based enough to maintain unpredictable fights and interesting one-on-one matchups. It doesn’t really care about being anything more. Rather than trying to compete with Blizzard in a straight genre fight, LawBreakers wants to enrich the old-school run-and-gunning of Unreal Tournament with just a smattering of modern Overwatch-infused sensibility. You can glean as much from the Battle Medics, Tokki and Feng, who carry big ol’ grenade launchers into the fray. And Battle Medics are the only class whose name isn’t overtly about killing; the Assassin, Enforcer, Gunslinger, Harrier, Juggernaut, Titan, Vanguard, and Wraith all share a common objective in their nomenclature. Perhaps the broadest gap in playstyle among these quasi-classes exists between the Assassin and Harrier. The former uses blades and nippy movement speed to cause trouble in close-walled areas, and force people away from objectives, while the Harrier needs some distance and elevation to get the most out of the Shoc-Croc laser rifle. Both are right there in the fight, deploying secondary abilities only as supplements to their primary role as fighters. For the more lumbering Vanguard and Titan classes, who have to work a bit smarter to get around, that fight’s happening at a bazillion miles a second. On that note, each of its modes is an aggravated, accelerated take on established match types. Uplink and Overcharge are about rushing to a central spawn location and grabbing the objective (a data uplink or a battery), then bringing it back to base and holding it for a countdown until that team scores. It is not reinventing the wheel, admittedly, but the sheer pace at which all this happens is flabbergasting. Overcharge mode differs from Uplink in that each team’s timer doesn’t reset when the battery’s stolen from their base, which means both teams can be at 99 or even 100% towards the end of a match, furiously scrapping to get it back to their charge point for the additional split-second that’ll secure the win. Blitzball operates under similar rules and at an even quicker pace. A ball spawns in the middle of the map – a ball that not only sports a voice but thevoice of Rick and Morty, Justin Roiland, no less – and as soon as it’s under your control you’re able to whizz it over to a score zone near the enemy spawn and earn one point. The whole endeavour takes about ten seconds in an ideal scenario, and five of that is waiting for the ball’s shields to deactivate so you can pick it up. The two remaining modes, Turf War and Occupy, are again recognisable control point fights which have had a razor taken to them. Turf War spawns three set capture points, which are locked once they’re taken before being reset during an intermission. Like Blitzball, that entire capture, lock, and intermission process might be 30 seconds long in a particularly smooth assault. Occupy, meanwhile, spawns a capture point that remains in place only for a few seconds before moving somewhere else and forcing the populace to take the fight along in tow. In truth, they’re the least engaging of Lawbreakers’ fleet, chiefly because they’re less suited to the game’s constantly-in-motion ethos, but also because they always seem to feature a few players who ignore the objectives entirely and concern themselves with padding their kill stats. 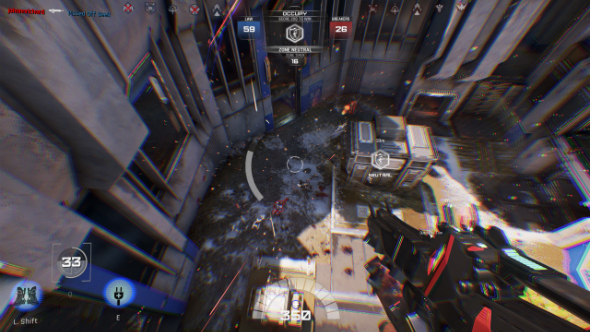 Maintaining that blistering pace while placing an emphasis on floaty, zero-gravity areas that bestow the player with verticality is one of Lawbreakers’ meanest feats. Each class moves at a different speed, and while the heavier Titan and Juggernauts do feel comparatively plodding, none end up being dissatisfying. In all but the most skilled hands this game would have been a recipe for flimsy, imprecise scattershot fighting, so it’s worth taking a moment to appreciate how well the player and environment actually interact here. Boss Key might not be explicitly breaking the rules with those modes, but they’re at least bending them to fit their vision, and doing so to great effect. That leaves the last element: how much the infrastructure LawBreakers creates actually empowers you to play in an inventive, devious, and tactically rich fashion. This is the bit that I’m personally still not completely sold on. It might be because it’s still very early days for a game like this, before any ranked play or esports-friendly spectator tools are introduced, and consequently the player base isn’t large or advanced enough to showcase Lawbreakers’ true potential. I’m open to that possibility. But it also might be that its vision of old-school online FPS gaming, with select modern trimmings, might not accommodate the kind of tactical depth that produces amazing ‘I never would have thought to do that’ plays in perpetuity after release. That’s the difference between the old and new schools, really. Go back and watch some Quake III Arena tournament finals and you’ll see bedazzling accuracy and second-guessing from every player, but you’ll also see them running the same routes through the map over and over. Within those old confines, one kill looked very much like another: an insanely accurate headshot from impressive distance in an unfathomably quick window of time. 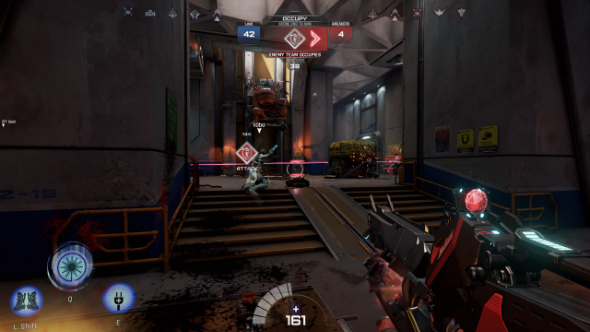 That’s very much alive and well in 2017 thanks to Couter-Strike: Global Offensive, and more obviously in Quake Champions and Unreal Tournament alpha, but the predominant vision of contemporary multiplayer shooters is so much more complex. That fact is best demonstrated by Overwatch Play of the Game sizzle reels, Battlefield’s staggeringly skilful and inventive highlights, or almost any video of Rainbow Six Siege matches. This is an important thing to consider when it comes to LawBreakers. When you’re in the groove of this game, the complexity found elsewhere seems like extraneous noise. In the moment, you’re sure that this brutally-immediate play style is the true path, and that other games have been deviating from it simply for complexity’s own sake. But on reflection, mentally playing back your finest moments and realising they were all basically flying through the air, kicking, shooting, and deploying damage-dealing abilities, you begin to wonder. But you never question whether the laws that LawBreakers breaks make for an enjoyable entity. That just isn’t in doubt: it’s wonderful fun. And you don’t wonder if the skill ceiling is high enough. It’s quite obviously up in the rarefied air, such is the prowess required to maintain your sights on a target while airborne and deploying jump and shift-bound traversal boost abilities. No, you wonder whether, in the absence of any true support characters – present in the fight but serving a function other than damage-dealing – that skill ceiling is actually bound to player accuracy and twitch-shooting rather than being the best at utilising your particular character’s skillset. And the longer Boss Key leave it before ranked play is introduced, the greater the danger there is of that emphasis on laser-precise headshots over clever team play taking root. There are more concrete, less chin-stroking issues LawBreakers must contend with first, though. Issues that all seem fairly likely to stem from low player numbers: specifically, oddly inept team balancing and painful lobby wait times. 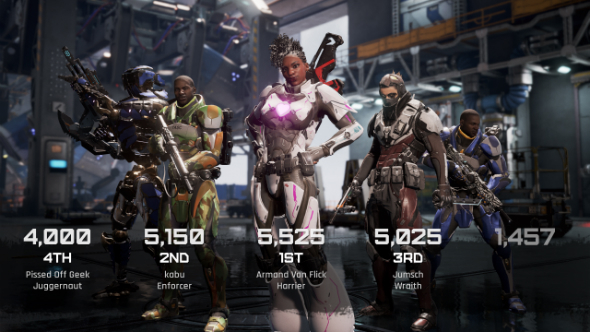 It’s a rare and beautiful thing to play a close match of LawBreakers right now. Usually it’s an absolute steamroll for one team or another, and despite the game’s insistence, in bright red letters, that it’s balancing the teams before the next round, a skill equilibrium never seems to be achieved. At the time of writing, Steamspy’s stats estimate 42,000 players in total since launch; that would explain why LawBreakers can’t find players of a similar level to pair against each other. There’s a firm foundation for a great competitive shooter here, but the rest of the house needs to be built on it sooner rather than later. 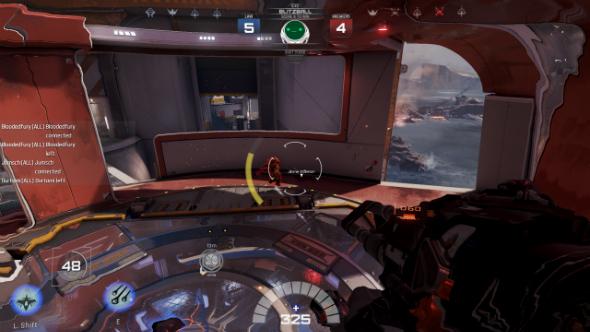 LawBreakers needs ultra-skilled players to come in and show the rest of us what’s possible, but they need a competitive format to entice them in. Until that happens it’s a dizzying and consistently exciting shooter, but one whose long-term appeal isn’t yet locked in.